Congratulations on your sale Jim! Love the gorgeous reflections from the lights in the water! Nicely done... Congrats on your sale! 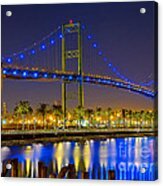 Such a great, colorful work of art, Jim .. congratulations on your sale!!!!! This is a stunner!!! WOW, what an eye poppin image! Pictured is the Vincent Thomas Bridge at night. 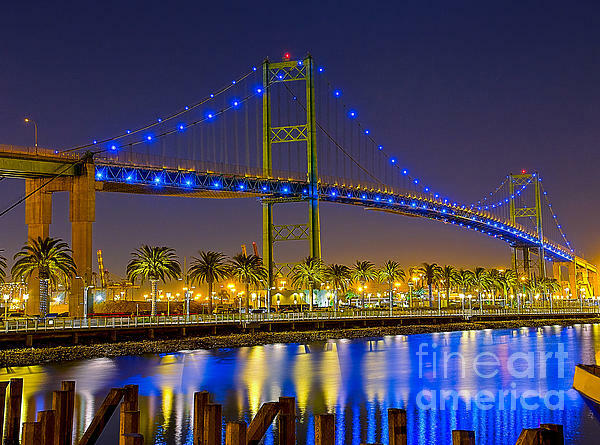 The Vincent Thomas Bridge is a 1,500-foot long suspension bridge, crossing the Los Angeles Harbor in Southern California, linking San Pedro, Los Angeles, with Terminal Island. The bridge is part of State Route 47. 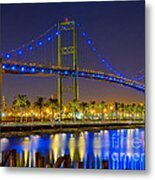 The bridge opened in 1963 and is named for California Assemblyman Vincent Thomas of San Pedro, who championed its construction. It is the fourth longest suspension bridge in California and the 76th longest span in the world. The clear height of the navigation channel is approximately 185 feet. 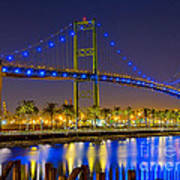 In January 2005, after 17 years of planning and fundraising, the bridge was illuminated with blue LEDs, powered by solar panels. There are 160 lights on the bridge and it is the first combined use of solar power and LEDs in a bridge lighting installation. Hello and thank you for visiting my website. I started photography in high school and continued my studies through college. I was fortunate enough to have a career in medical imaging and photography. I now do mostly sports photography, but also enjoy taking photos of classic cars, vintage U.S. coins and the California coast. Classic cars and vintage U.S. coins show off the amazing beauty of our past. They are truly a wonderful part of our history and should not be forgotten! All coins pictured come from my personal collection. Both the coins and cars require technical work and that makes the work even more rewarding! Please visit me at www.JimCarrellPhotography.com Thank you and have a great day.